From the vaults of Carl Meyer, an original album review written in November 1981. It is easy to dislike Queen. At their worst they are pretentious, pompous, noisy and so smug it borders on the pathetic. Besides, they are old fashioned: Exponents of the empty headed escapism of pomp (ous) -rock. However, all their albums (there’s already ten of them, believe it or not) contain some good tracks; the problem is that they suffocate in a gray mass of noisy and/or sickly sweet gibberish. Then “Greatest Hits” arrives … and Queen must be reconsidered. The album-title is exceptionally precise. Every one of the 17 tracks included have been hit singles in the UK. That’s right, Queen was, is and will always be a hit machine. Forget those messy albums. Hits, hits, hits, that’s what they’re all about. Always catchy and simultaneously wonderfully complicated, all different from one another, these guys are no lightweight act, they are masters of the 7 inch. 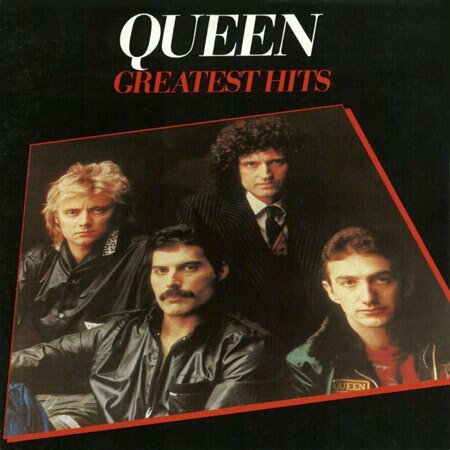 “Greatest Hits” puts the group’s phenomenal versatility on display: The operatic, overwhelmingly wonderful “Bohemian Rhapsody”, the slightly quirky and humerous “Bicycle Race”, the magnificent funk stomper “Another One Bites the Dust” (it just grows and grows on you), the happy, sauntering “Killer Queen”, the football-sing-alongs “We Will Rock You”/ “We Are The Champions”, the spot on rock’n’roll pastiche “Crazy Little Thing Called Love” and the heavy metal explosion, “Seven Seas of Rhye”. And that’s to name but a few. Everything is coated with Queen’s unmistakable guitar timbres and multi-tracked voices. 17 cuts in all, “Greatest Hits” is a revelation and pure joy from start to finish. It is the first Queen album I would have bought. Be aware of the fact that the track listing differs from territory to territory. Some editions include the brand new recording “Under Pressure” that Queen did with David Bowie. As total playing time is almost one hour, the sound quality does suffer.